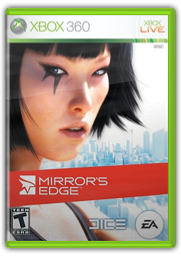 As we approached the holiday gaming flood, Mirror’s Edge was on my “it has potential” list as opposed to my “must buy” list. After getting my hands on the demo a couple weeks prior to its release, that changed. But with so many games just out, and still a handful of big titles on the horizon, I decided to rent it. I found myself really enjoying it for the first couple missions, but after a few I was getting bored of the same old situation. With just a couple missions left to play, I threw in the towel entirely. So I guess I’ll never find out… oh wait, what was the story about again? Unfortunately, you’ll have to throw Mirror’s Edge in the pile of games that branch out into uncharted areas in one way or another, but fall short it every other. It’s one of those, “next year’s sequel will be great!” games. It feels almost as though no one outside of the development team actually played the game before its release, which makes us the testers. So its almost worth taking a pass now to avoid disappointment, and picking up Mirror’s Edge 2, which will surely be a much better and more polished experience. One aspect of Mirror’s Edge that’s undeniable, is the visual style. In a time when I find myself bumping up the brightness in most games I play, Mirror’s Edge is the complete opposite. It’s bright and vibrant, and just full of colour! A great deal of the game takes place on rooftops in broad daylight. Everything is over-saturated and most colour is wiped out, with the exception of the objects highlighted by “runner’s vision”. But even the interior levels are nice and bright, with plenty of wall-fixed light fixtures and fluorescent overheads to maintain the mood. What the Hell is Parkour? Parkour is an activity with the aim of moving from one point to another as efficiently and quickly as possible, using principally the abilities of the human body. It is meant to help one overcome obstacles, which can be anything in the surrounding environmentÃƒ¢Ã¢â€š¬Ã¢â‚¬from branches and rocks to rails and concrete wallsÃƒ¢Ã¢â€š¬Ã¢â‚¬and can be practiced in both rural and urban areas. The problem with Mirror’s Edge, is that flow and momentum are constantly interrupted. That is, until you’ve played a level enough times that you have each maneuver memorized and timed perfectly. There’s a feature called “runner’s vision” which paints the trail you’re supposed to follow red. But it’s not always there – especially in situations when you need it most. The majority of the game is spent running away from dudes who are shooting at you with automatic weapons, and in many of these circumstances, runner’s vision is disabled. I found this to be particularly frustrating, and it ended up bringing the game and excitement to a screeching halt. When it works, it’s great! Lots of fun and really satisfying when you string together some crazy maneuvers. Unfortunately, I found the number of these moments dwindling as I played through the campaign. What makes this game truly different is the first person perspective – which is also what holds it back in a big way. A lot of the jumps and grabs would be easier made if you had a wider viewpoint or could see what your character is doing. I found that the more technical maneuvers, which required you to run along or up a surface, turn, then make another jump, were often missed the first time. It all comes down to timing, and when you’re running up a wall, you’re face is just a few inches from it, so you have no idea how high you are and when you need to make your turn or jump. This results in many, many over or under-shot jumps, missed grabs, etc. = frustrating. The more I played the game, the more I thought it would be better as a third person action game, similar to the Prince of Persia series and Assassin’s Creed. Both of which I found to be more fun and satisfying overall. The characters are all kinds of lame and the story and voice acting are painful. So much so, that I started skipping cut-scenes after the first 2 chapters. I realized quickly that you can play the game without knowing what’s going on in the story and it doesn’t make a lick of difference. You basically just have to keep reaching the point they tell you to, taking out and avoiding the baddies along the way. But, I Don’t Want to Fight! There’s an Achievement for finishing the campaign without firing a shot, which was my full intention from the get-go anyway. It just so happened I was going to get rewarded for it. Unfortunately, the game takes a turn towards combat a few chapters in, which only gets heavier as you progress. It got to the point where I had to jack some dude’s shotgun and start blasting dudes. That’s when I lost interest all together. I play a lot of shooters, and I thought Mirror’s Edge was going to be this refreshing change of pace – that wasn’t the case at all. 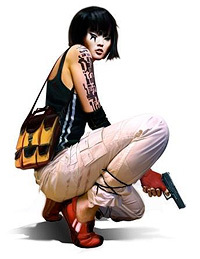 With the onslaught of great games we’ve been hit with this year and the inevitable sequel in the works, I’d say Mirror’s Edge is a pass all together. Download the demo, or rent it for a few days. Maybe pick it up second hand for cheap.